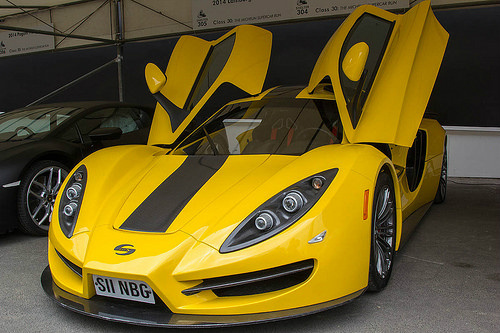 In 2013, Sin Cars launched their road-racing R1 sports car, which was to be built in the UK. Powering the track variant was a mid-engined, 6.2 litre, V8 unit, sourced from the Chevrolet Corvette, that developed 525 bhp and 500 ft/lbs of torque. Fitted with a Graziano six speed manual gearbox powering the rear wheels, it produced a top speed of 200 mph, with 0-60 mph in 2.5 secs. With a carbon composite body on a tubular space frame chassis, it had a curb weight of 1100 kg. It used 360 mm AP Racing discs all round, 19 inch wheels, adjustable suspension, a rear wing whose position could be fine-tuned, and a 40:60 weight distribution. It had a full roll cage, and the simple interior included a racing steering wheel and seats. The road-going version, with a top speed of 170 mph and 0-60 in 3.5 secs, was priced at around £75,000, whilst the modified track variant was estimated to came in at a further £50,000.